Blind Guardian are without a doubt one of the most important German Metal bands. In the year of 1984, singer and bassist Hansi Kürsch, guitarists André Olbrich and Marcus Dork and drummer Thomen Stauch come together in Krefeld as Lucifer’s Heritage and record the demo tapes “Symphonies Of Doom” and “Battalions Of Fear”. They change their name to Blind Guardian and sign with No Remorse Records , who release the debut album, also titled “Battalions Of Fear” (1988). Marcus Dork leaves the band; Marcus Siepen replaces him as rhythm guitarist. The second album “Follow The Blind” (1989) offers first small experiments with orchestral, choral and acoustic elements, all which will later on become essential parts of Blind Guardian’s music, along with more progressive song structures. This is the first record being published by the major label Virgin – a big step, especially for a Metal band. This album also features “The Bard’s Song (In The Forest)”, which is traditionally sung by the crowd at concerts. Their success offers Blind Guardian the possibility to tour in Japan, where they record their first live album “Tokyo Tales”. 1994 sees the band working on “Imaginations From The Other Side” with Flemming Rasmussen who had already produced for Metallica. For the following tour they even travel to Thailand. In 1998 “Nightfall In Middle-Earth” is released, which many fans consider their best effort to date. The books of Tolkien had always been a huge influence for Kürsch, who writes the band’s lyrics, but this is the first time one album is exclusively about this topic. Blind Guardian embark on extensive tours including South America. The next album, “A Night At The Opera” (2002), makes the US Independent Charts. In 2005 they sign with Nuclear Blast and drummer Thomen Stauch leaves the band, being replaced by Fredrik Ehmke. For “A Twist In The Myth” they focus on their rawer side, trying to sound more like their earlier sound. 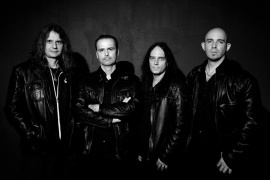 After a few successful tours and an appearance in the video game “Sacred 2”, Blind Guardian return to the studio, where they record “A Twist In The Myth”. In the moment, the band is working on their next record, which is expected for 2015. Register now your email address and never miss events, dates and news for BLIND GUARDIAN.